‘Gnome Race e-books’ are a set of 10 bedtime stories for Children, they are available in Apple’s iBook store. The Gnome Race fantasy world comes with a whole storyline. This is being told in 10 stories. All the main characters get to play their part in their epic adventures. Central character is Brumm. Our heroes get involved in all kinds of adventures together with his friends. The stories are available in text or in a spoken e-book. The latter is available from Apple’s ibook store. 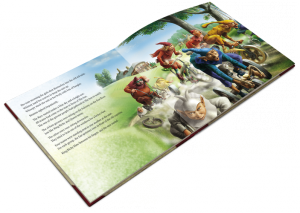 The books are illustrated with the stunning artwork of the acclaimed ‘Het Geel Punt’. Gnome Race is a ® brand of Lagali. Artwork: Het Geel Punt bvba.